I often make the mistake with short story collections of reading them end-to-end, like a novel, so that I am struck by the discontinuity of the tales – which typically have unique provenance separated by many years that were never intended to be housed together. Thus, by the time I finish the collection the stories are just a blur. 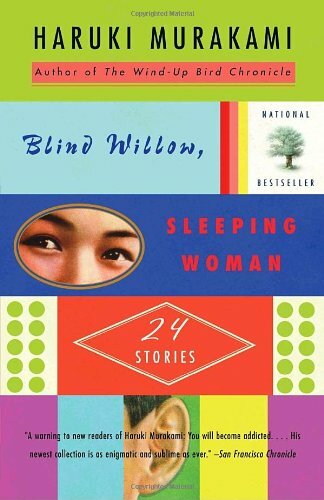 I took a far different tack with Blind Willow, Sleeping Woman by Haruki Murakami, dipping into it irregularly over many months, savoring each one. Whether it was due to this new approach or because of the quality of the selection, I found Blind Willow, Sleeping Woman a far more satisfying read than The Elephant Vanishes, another collection I read a couple of years back that left me (except for the title story) mostly underwhelmed. Full disclosure: I have a love-hate relationship with Haruki Murakami, whose novels are usually stirring and well-written yet often lack resolution with critical characters and plotlines so that by the last page the reader is not so much dissatisfied as unsatisfied. Still, Murakami – along with Cormac McCarthy and Richard Flanagan – remains solidly among my top three living authors of fiction. I have read eleven of his eighteen published works, and I just began another, Sputnik Sweetheart, which makes me a serious and perhaps obsessive fan. The first one I read, Kafka on the Shore, was recommended to me by a barista and remains my favorite Murakami novel as well as one of my favorite novels of the new century. I liked the celebrated Norwegian Wood far less, although most fans would take issue with me here. Two others – Wind-Up Bird Chronicle and 1Q84 – were terrific reads that left me so frustrated due to lack of resolution that I gave them less credit than they deserved at the time, yet I have not stopped thinking about either in the years that followed. Side note: I entitled my review of 1Q84 on Amazon in 2013 as “Tedious Epic” and awarded it a mere three stars. Today, despite its flaws, I would revise that to at least four stars and have even considered rereading it. That’s Murakami for you! As it was, my literary “theory of evolution” failed to materialize; although elements of both the characters and techniques apparent in his novels are evident in many of his stories, these barely changed over time. The very early “Firefly” (1983) personifies the weak-willed, complacent male protagonist. (“Firefly” actually gets new life as a segment in the novel Norwegian Wood.) The same can be said for the title story, “Blind Willow, Sleeping Woman” (1983). Most of his stories from this era – about half the collection, many of which appeared in the New Yorker – were not among my favorites, and reading “The Year of Spaghetti” (1981) and “A ‘Poor Aunt’ Story” (1980) especially kindled memories of the kinds of short stories that were popular in the New Yorker and elsewhere in the 1980s and 1990s by a number of authors of contemporary fiction that usually left me shaking my head at the lack of direction or resolution. The exception is in several early stories – such as “Crabs” (1984) and “Man-Eating Cats” (1991) – that hint at the magical-realism that is later so impressively developed in novels like Kafka on the Shore and 1Q84. My two favorites in the collection are magical-realism all the way: “Dabchick” (1981), which could be the script for an episode of Twilight Zone, and the masterful “The Ice Man” (1991), both of which adeptly mix magic, irony and allegory. More down to earth, it is worth mentioning the extremely well-written “Tony Takitani” (1990) that neatly captures Murakami’s gift for fine story-telling with an ever-present wisp of vague metaphor. I cannot resist pointing out that Murakami’s weird earlobe fetish shows up both in “Birthday Girl” (2002) and “Chance Traveler” (2005). My other favorite stories in the collection were all written in 2005, which perhaps implies that the author hit his stride with short story writing in that year. In addition to “Chance Traveler,” these include “Hanalei Bay,” “Where I’m Likely to Find It,” “The Kidney-Shaped Stone That Moves Every Day,” and the oddball “A Shinagawa Monkey” that strangely reminded me of something from Rudyard Kipling. If you are a Murakami fan, this collection deserves a read. If you are new to the author, some of these stories may indeed tickle your fancy, although I would recommend instead that you start with one of the novels, such as Kafka on the Shore. Either way, you may find yourself as obsessively hooked as I am, and unable to resist going back for more.